A change of government within the next week is a possibility. Transport has already been quite a high-profile part of the election campaign, and a change of government could mean fundamental change for the transport sector in areas well beyond just the headline large flashy projects where much of the attention gets directed. Let’s take a look at the ways in which a new Government could really change things, and how that might play out after September 23rd. The Government’s main legal document for setting the strategic direction for transport is the Government Policy Statement, or GPS for short. This is an incredibly important document as it sends a clear message to NZTA about the key outcomes Government wants from the billions of dollars a year spent on transport, as well as setting some clear financial parameters for the balance of investment the Government wants across state highways, local roads, public transport, walking and cycling, road safety and more. The funding bands themselves are also potentially due for significant change – many of the major rapid transit projects that Auckland needs don’t neatly fit into the current band structure. Are they state highways? Are they public transport? It’s also a no brainer to allow rail projects to get funded through the normal transport budgeting process rather than have to compete against all government priorities for funding. It was only an ideological decision in 2009 that excluded rail from being funded through this normal process. The ATAP process ended up describing rapid transit projects as ‘Strategic Public Transport” which is a good way of thinking about it so at the very least, perhaps changing the State Highways band to Strategic Transport and corresponding changes as to what can be funded from it would be useful. Beyond just the funding bands, the GPS also needs to be the key tool Government uses to establish a change of direction. The current GPS focuses on supporting economic growth and productivity, improving road safety and achieving value for money. Arguably these are pretty good focus areas, even if the actual detailed policies and funding priorities which have been implemented have been woeful failures (value for money is down because the RoNS have low BCRs, congestion is grown rapidly, and the road toll has increased substantially in recent years). A new Government would probably want to raise up a fourth priority area around reducing the environmental impacts of transport, especially if it was serious about mitigating climate change. Inter-city passenger rail would also clearly need to be pushed through the GPS, with funding commitments. Of course we would hope the GPS would actually spell out a clear and successful path to achieving its high-level goals – which would be a marked change from the current GPS which (as noted above) has arguably failed at achieving any of its high level goals as congestion has grown, the road toll has grown and value for money has plummeted. This probably means it would need a major rewrite. After years of bickering over transport, the current Government and Auckland Council finally worked together on the Auckland Transport Alignment Project (ATAP), which was published last year and then updated recently to reflect higher than expected population growth. While generally sound at a high level, ATAP arguably struggled to do the very task most required of it – make some tough decisions about which projects should and shouldn’t be a priority for Auckland. Instead (and particularly after its recent update added in Mill Road and Penlink) it seems ATAP largely took a compromise position of “just do everything and tweak the timings”. With a new Government likely to have a much greater aspiration for investment in a a public transport programme in Auckland, either some major new revenue sources are going to be required or some tough decisions are finally going to be necessary in terms of not building some of the lower value roading projects included in ATAP. Labour’s position to review the East West Link project seems like a really good step in the right direction. Integrating transport funding decisions with land-use planning much better. It is crazy what a tiny impact the transport implications of planning decisions have on how those decisions are made, and vice-versa. Providing much clearer legislative guidance to how rapid transit networks are developed, probably through clearly identifying NZTA as the lead agency for developing those networks, regardless of mode. Overall, if the Government does change on September 23rd it could have quite a massive and long-lasting impact on the transport sector. ATAP would be easy and cheap to repeat. They just get the agencies in one room and list the projects they want to build as Decade 1, the projects they have no intention of ever building as Decade 3 and the rest end up as Decade 2. Then they brief the staff to justify their picks. It worked last time. Who would you put in the room to advocate for health and environment? Or would there just be a bottom line: justifying one’s picks involves justifying them on the basis of meeting public and environment health and carbon emissions objectives? would such claims be outright banned from the room, or would each member of the discussion be given a party ratchet noisemaker thingummy to spin whenever someone makes such a claim? Don’t think they included any of that sort of thing last time. They just listed their favourite projects, mentioned in passing the ones they didn’t want to do and damned road pricing by claiming they supported it but based on technology that doesn’t exist yet. My point is if you want a once over lightly then just redo ATAP. Normally they what 15 years between rinse and repeat, but I see no harm in doing them every other year. It’s not like the old days where people had to print out these BS reports. 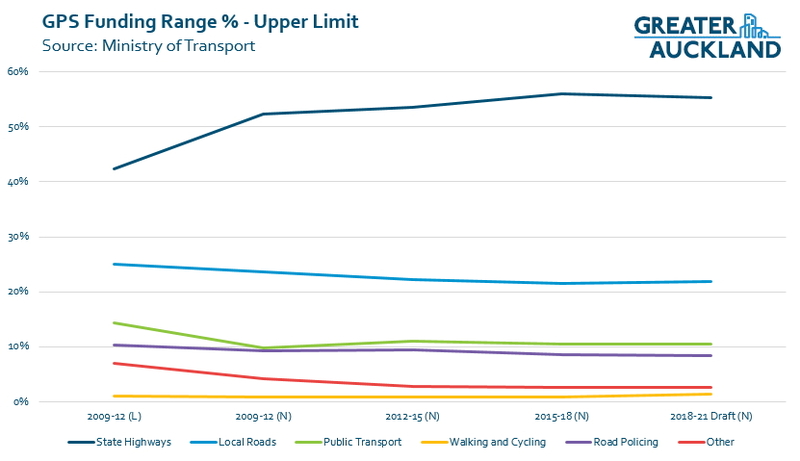 NZTA policy is sooooo regressive…embarrassing. Any views on Kirkbride costing over the $200 million mark and not making traffic any better?? On the LTMA, where do you stand on Governments directing NZTA to pursue particular projects? Has happened under recent National-led Governments and appears likely to happen under a Labour-Green Government. Despite being contrary to law. In Wellington the first test of a New Government will come quickly. Totes agreement – keep the non polluting leccy buses until they can find an electric replacement – should only be 5 years away. Thanks Matt. I have a few specific suggestions along the lines you are suggesting. 1. We need a program for rail funding to give certainty along the same lines as RONS. Either replace it with a transit program, or make it multi modal, or split into urban and rural, with the urban one mainly PT. Apart from links to ports and industrial areas (the only places where the freight argument is genuine) urban road capacity expansion is a waste of money. 2. Mandate urban planning guidelines that are multi modal. The EU SUMP guidelines are a good starting point. 3. Price parking in CBDs. Why give a giant financial freekick to the owners of car parks? They impose huge roading costs. Wilsons are foreign owned (Hong Kong) anyway. So tax them. The levy should be per space per year, so it is not directly on commuters. The parks will be charged to motorists at what price the market will bear either way. The revenue should be hypotheticated to subsidise PT and active transport alternatives, to gain public acceptance. 4. Make reforms to reduce costs. In France if you upgrade a road (or put light rail in it!) the service authority must move pipes at their own expense. This deters irrational placement of services in road reserves that contribute up to 1/4 of the cost of road and LRT projects. Common services trenches in the footpath make far more sense. At present there is no financial incentive for the service authority to act sensibly, because the transport authority picks up the bill every time. 5. The East West link should be halted on day one. The money saved can fund public transport with no harm to the budget. +1 to Scott. In 3. I would add that suburban parking needs to be part of the overall plan too. Child cycling and walking safety is being compromised by the increase in roadside parking. Near bus stops, it is often from commuters driving part of the way to work, then taking the bus. This needs to be tackled as part of the overall plan, with better PT in the outer suburbs reducing the need to take the car part way, and with parking removed near bus stops, along with the provision of plenty of bike parks to cater for people who cycle part of the way, then bus. Heidi I would agree. I would start with the CBDs to get the principle established, then spread to regional centres. Wherever road congestion was sufficient to create a problem with roadspace allocation, the principle should apply. I pay $100 per year for a bike locker at the train station (which I dont object too) but motorists get to park for free. Seems a bit backwards to me given the spatial requirements of each mode! Not unlike the thinking that allows cars to drive over the Harbour Bridge for free but will require cyclists and walkers to pay a toll. In the happy event that a Labour/Green government comes into office I will be hoping that they establish some environmental credentials early on by abolishing those prospective tolls. No way? I had no idea that was the case – which train station is this? And yes transport is typically a local election debate. But central government spends way more then any local government. I have read national’s transport plans and Labour’s. now national has a very clear plan build lot’s of road’s throughout the country. Plus a couple good bits for Auckland rail. And Labour’s plan is Auckland light rail but not much road’s for the rest of the country, my concern is that could loose labour the election. If I was Labour I would promise two things to the regions. More road maintenance money (great for rural council employment) and more smaller projects. For example all those Northlands bridges. The RONS projects sound great but most of the work goes to big road builders based in big cities. And they are costly so there is little money left to do the basics. Scott (and Heidi) agree with all your points. 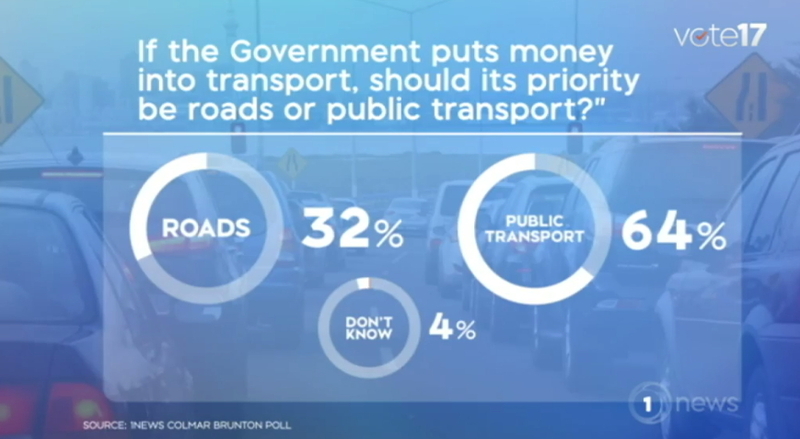 yes apart from quite early on when the greens/labour (light rail, regional rail) v National (roads) announcements, there’s definitely been a lack of transport related discussion, especially in the televised debates. But, maybe there’s been a reluctance to make it all about Auckland/upper north island so as not to turn off the rest of the country? I look forward to a labour win. Just a few changes to the funding and doing what the people want (ie 64% support more PT) as in a good democracy will have big benefits. It has been so disappointing following the NZTA’s lack of transparency and it’s unusual decisions over the years. I hope even a National led coalition will probably require the support of a more mode balanced coalition partner than what the current parliament has delivered. But if it is Winston, doesn’t he want to dish out all the money to the regions and the oldies? We might get even less spending in Auckland. And with this Fuel Pipeline rupture at Ruakaka there will now be more tankers on the road . Now if the politican’s had extended the Rail line from Oakliegh to Marsden Point and upgraded the NAL Fuel then could be moved in larger amounts by rail than by road as a stop gape measure as they could run a train down at night to restock the Wiri Tank Farm . But then again does KR still have enough Tank Cars in their fleet? or would they have to hire them from the preservation societies . There are no tank wagons however there are plenty of 20 foot ISO tanks in the country which could be placed onto a tandom axle truck trailer and used to bring the fuel down to Wuri. They may be doing this I don’t know. One thing Av gas is less flammable than petrol but anyway I see more flammable liquids than petrol being carted around Auckland all the time in ISO tanks so it must be legal to use them on the road but maybe the tractor units would need to be modified..I am surprised that road transport hasn’t got the capacity to cover the shortfall. The road tankers have to be driven by appropriately certified drivers, which is a practical capacity constraint. i.e a class 5 Licence and a Dangerous Goods Endorsement and that is just to get behind the wheel of the tanker . Plus any site safe documentation . Royce it’s (AVTUR) JET A1 that is required at the airport. Regarding the fuel pipeline failure, does anyone have any data on the supply situation? E.g. what is the volume of fuel per day Auckland uses, versus the transport capacity per day without the pipeline? are we sure that it will be OK after the current Auckland service stations have served out their current tank-loads? Also (obvious statement) the fuel crisis highlights another benefit of the Congestion Free Network. It is also a Petrol Free network. if the peak oil theorists are correct and our oil supply continues to dwindle, then we may need to have a transport system not reliant on fuel (at all) within, say, 30 years. At current rates of expenditure, if we are only building one new line every 3-4 years, it will take us the whole 30 years to build a complete network. So we need to start now. The CFN2 is not petrol free as it contains a number of rapid bus routes. I suspect the drop in demand for petrol through increases in electric cars will happen before the supply runs out, it’s happened before with other resources. Fair point. Though with a smaller number of fixed routes, the CFN2 bus components could easily operate electric or hybrid buses. The fixed nature of the network would lend itself well to bus charging stations at major stops allowing electric buses. Just realised I was technically wrong as of course buses generally run on diesel not petrol! Either way you are right in that it reduces fuel demand as people in buses use less fuel than cars. Also of course our electricity network is not foolproof either, the 2006 outage would have a much bigger impact these days with much greater use of the rail network. Unless Labour can get its vote out (National are surging in the latest polls), there is not going to be much to smile about regarding public transport in Auckland any time soon.